Each year, weather permitting, a pilgrimage is made to the site of the now deconsecrated ruin of St James’ Church, Lancaut. A service is held within the ruined building. Look out for details. Lancaut (Welsh: Llan Cewydd) is a deserted village in Gloucestershire, England, located alongside the River Wye, around two miles north of Chepstow. 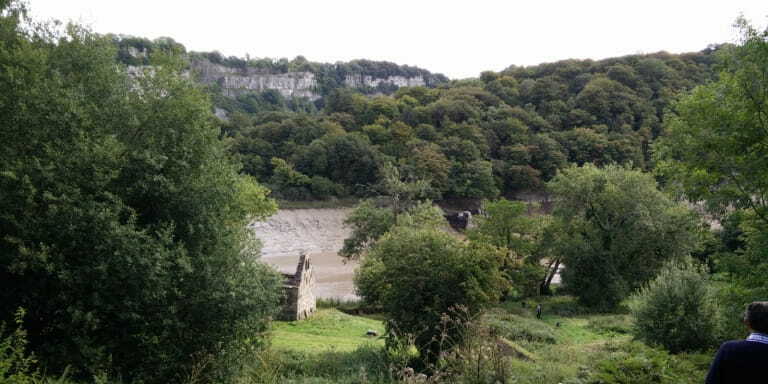 It occupies a narrow-necked promontory formed by a curve of the river, which acts as the border between England and Wales. Little remains of the village today, except for the roofless church of St. James. Today the only significant trace of the village above ground is the church of St James, which is a Grade II listed building within the site of a scheduled monument. Ecclesiastical records in the Book of Llandaff refer to a religious establishment of lann ceuid probably at this location, which is likely to have been established by 625 AD. A monastery was recorded here by 703. However, the construction of the church dates from the 12th century, the arch remaining across the chancel dating from this period. 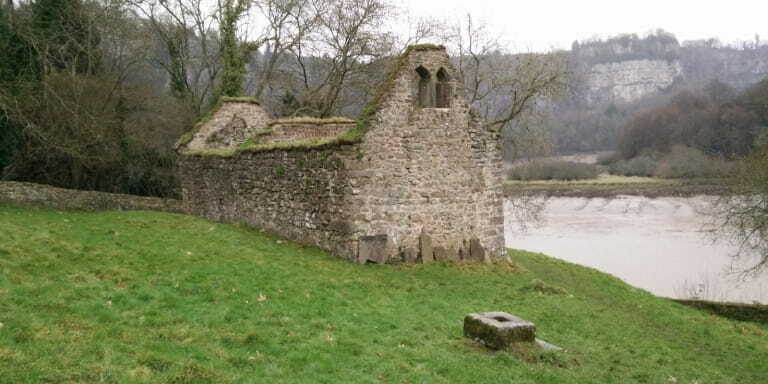 The theory has been put forward that the settlement was connected to the Cistercian monks who founded their substantial Abbey up-river at Tintern in 1131. A cast lead font in the church, comparable to other local examples from the same mould, can be dated precisely to between 1120 and 1140. This font is now in the Lady Chapel of Gloucester cathedral. Another suggestion is that it may once have been the site of a leper colony, and an unusual number of medicinal herbs including the non-native elecampane - once used to treat respiratory ailments - and green hellebore has been found in and around the churchyard. Until 1711 the church was an independent ecclesiastical parish. After this date it was merged with another local parish, the new living being the rectory of Woolaston. Despite this, the church appears to have been substantially restored and rebuilt after this time. The double bell window still visible in the West wall was supplemented by a small bell turret in the roof above. In 1840 the antiquarian George Ormerod made drawings that record the church as having box pews and a pulpit fitted inside. By the 1860s though, the parish congregation was reduced in number and services were only being held here during the summer months. In 1865, the Rector of Woolaston ordered that the church be abandoned. The roof and the interior fittings, together with the font, were removed. Church and village both declined after this time, and the church was deconsecrated. In the 1980s the chancel arch partially collapsed, prompting some restoration and consolidation work, together with archaeological study. Repairs were undertaken to the churchyard wall in 2010. In December 2013, the church building was purchased for a nominal fee of £1 by the Forest of Dean Buildings Preservation Trust. The Trust intends to carry out a programme to stabilise the building.